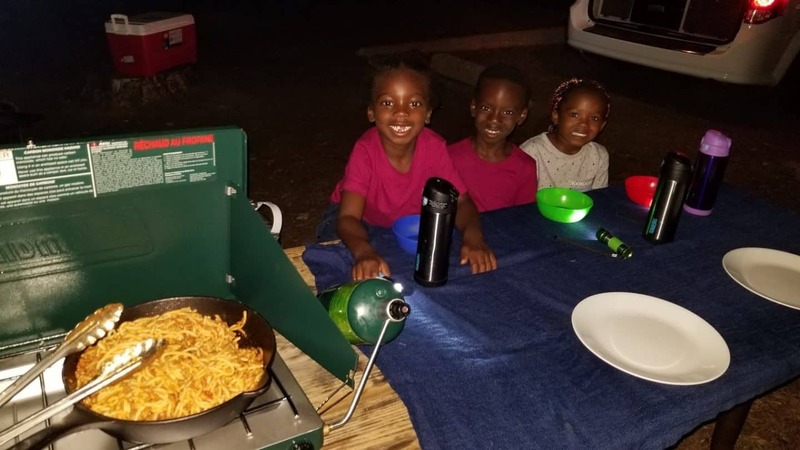 When the kids started continuously asking about going camping, I knew this summer would be the perfect time to plan a camping trip. I wanted to make the camping worthwhile, so making it a road trip as well, and visiting at least 3 national parks was part of the plan. 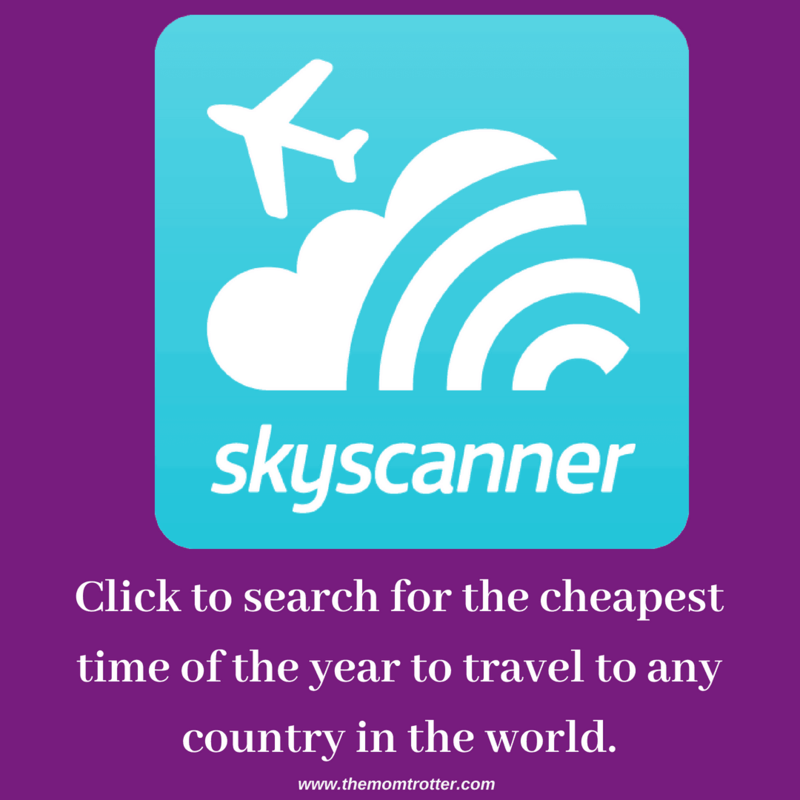 In order for this trip to go smoothly, we would need to rent an RV or Campervan. Prior to this trip, I had never tent camped or even camped at all, so renting an RV or Campervan were my only two options. I immediately started searching for RV rentals, but given the size of the RV, I knew I would not be able to drive it. My husband was not going to be able to join us on this trip, so renting something I knew I could drive and easily navigate was priority for me. This is when my search led me to Jucy RV Vans. 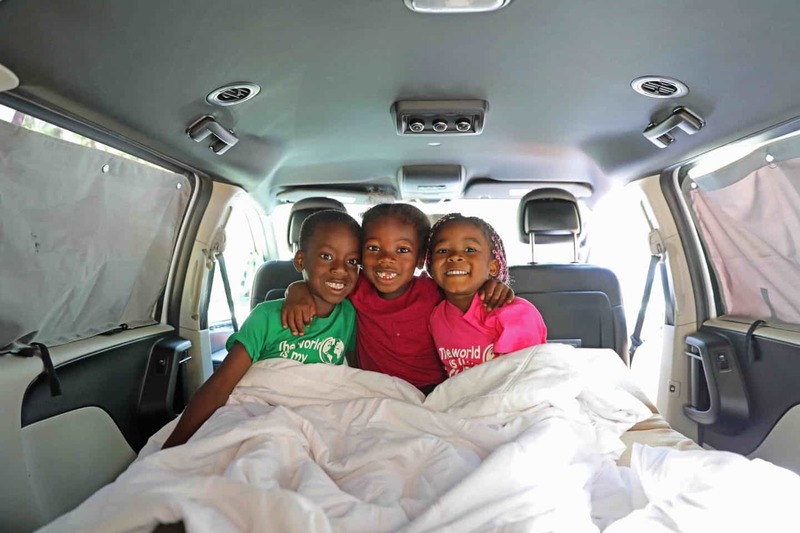 Jucy RV Vans are equipped with a place to sleep inside and u on the top, as well as a kitchen and fridge on the back of the van. It had everything I needed and I was even more excited to find out that they had a pickup location in the Los Angeles area. I watched a few YouTube videos and knew right away that it would be exactly what I needed for our trip. 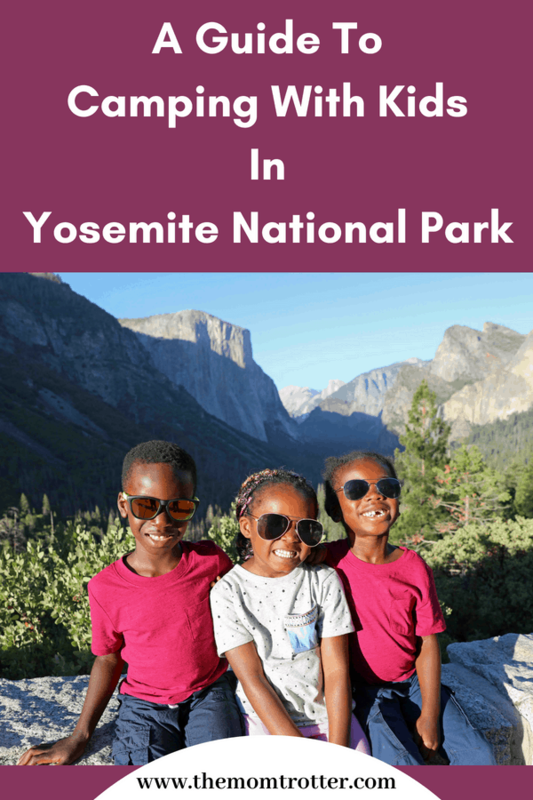 We drove to Yosemite National Park with kids in June. 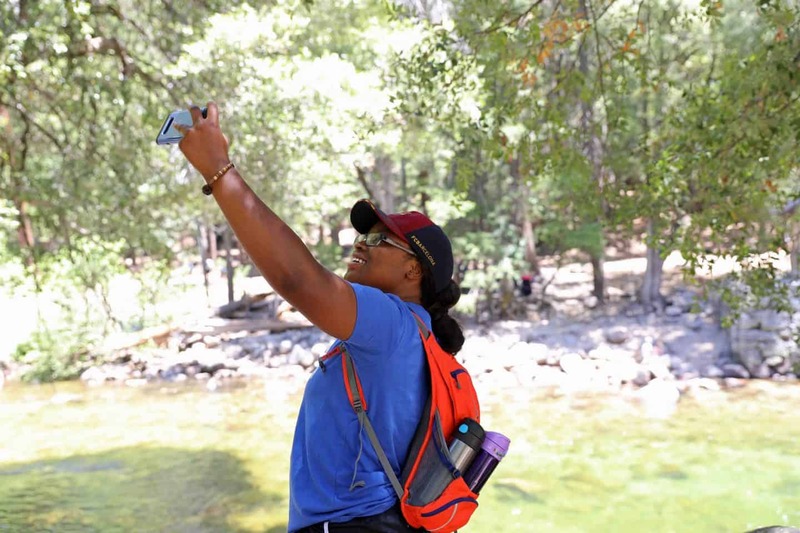 The weather in Yosemite was hot in the afternoons, and cool at night. It was the perfect mix, especially for camping in a campervan with no access to AC at night. At night time we rolled down the windows and enjoyed the breeze and sounds of the forest while we slept. It was very peaceful and calming. 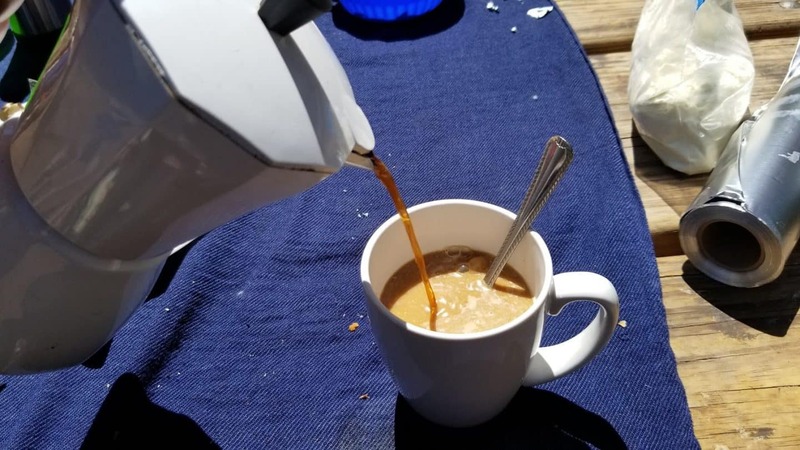 Pro Tip: Make sure to pack a light sweater for very early mornings and late nights, as it gets a bit chilly even in the summer. 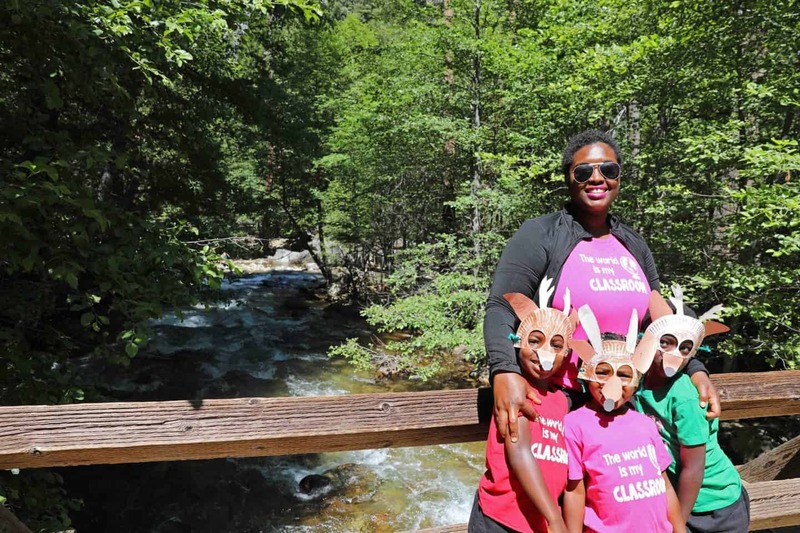 We started our camping road trip in Sequoia National Park. 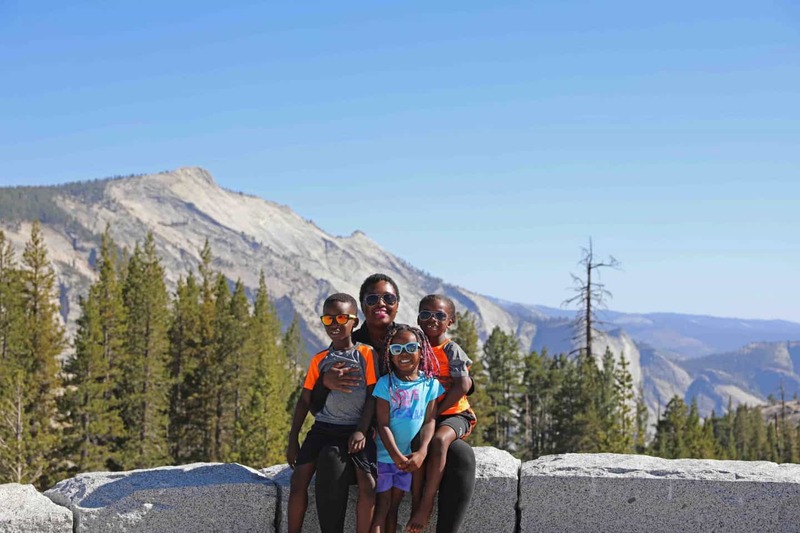 After spending 2 days in Sequoia National Park with kids, we then drove to Yosemite National Park with our Jucy RV Van. The drive between both parks took us a total of 5.5 hours. It would have been shorter; however, we encountered some traffic on the way. I did not realize that getting through this entry gate still meant an additional hour and a half drive to our campsite. So keep that in mind when driving and make sure to fill up your gas tank before you get closer to the park. There are bathroom right when you go in, so make sure to stop and use them before the long drive up. 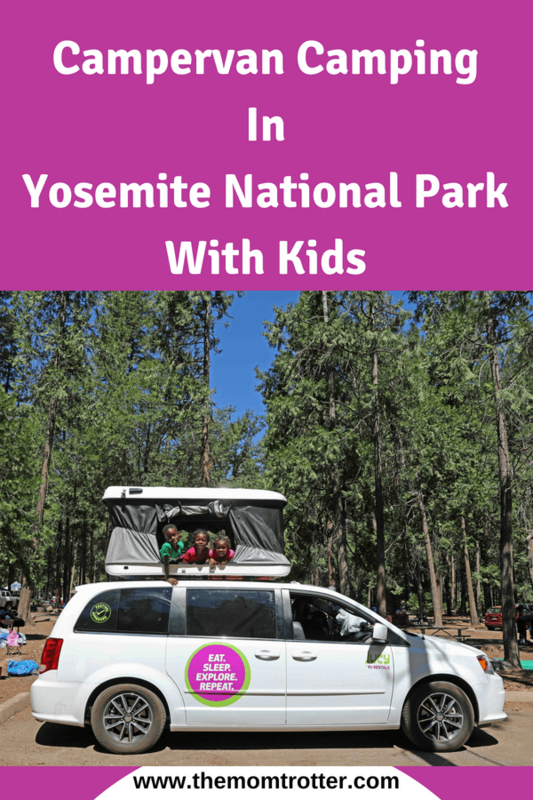 Once we got to Yosemite National Park, we park the Jucy RV Van in our camping spot and did not drive it around again until it was time for us to leave. 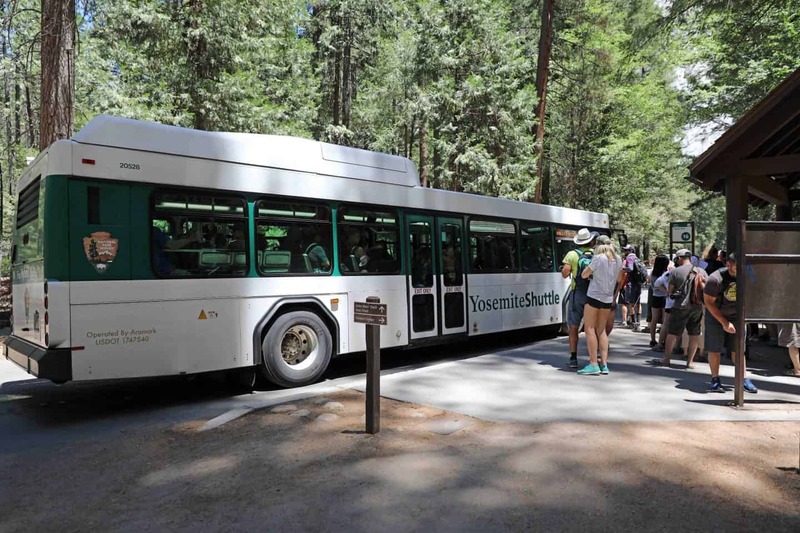 Yosemite has lots of walking trails, as well as a shuttle bus that takes you around if you need to get around. Yosemite is really big, much bigger than I ever expected, and so the shuttle runs often to get people around. 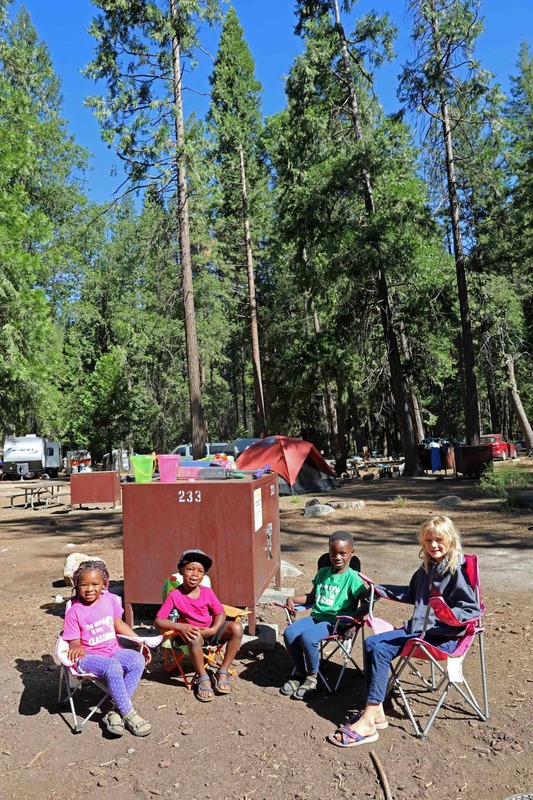 I spent hours un-end asking in Facebook groups and reading about best campgrounds in Yosemite National Park with kids. 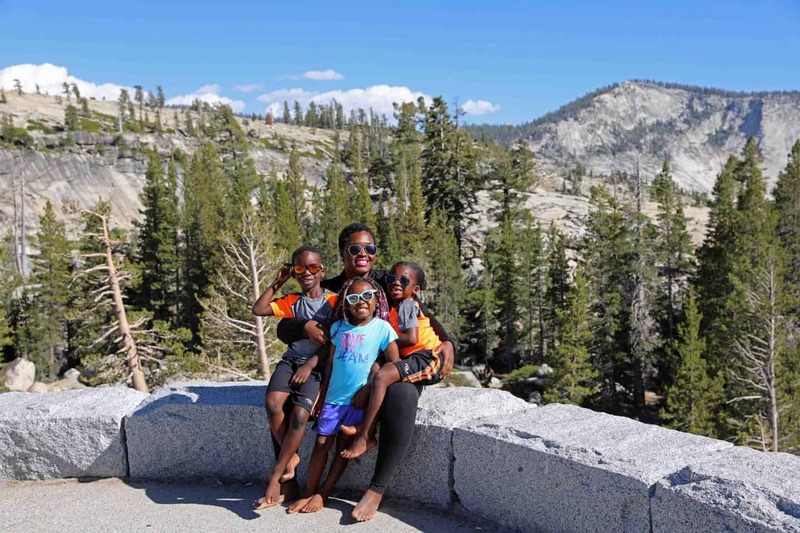 Weirdly enough, I couldn’t find any blog on it or anything really, that detailed what camping with kids in Yosemite National Park would be like. I wanted to know what to expect, especially as a first timer. 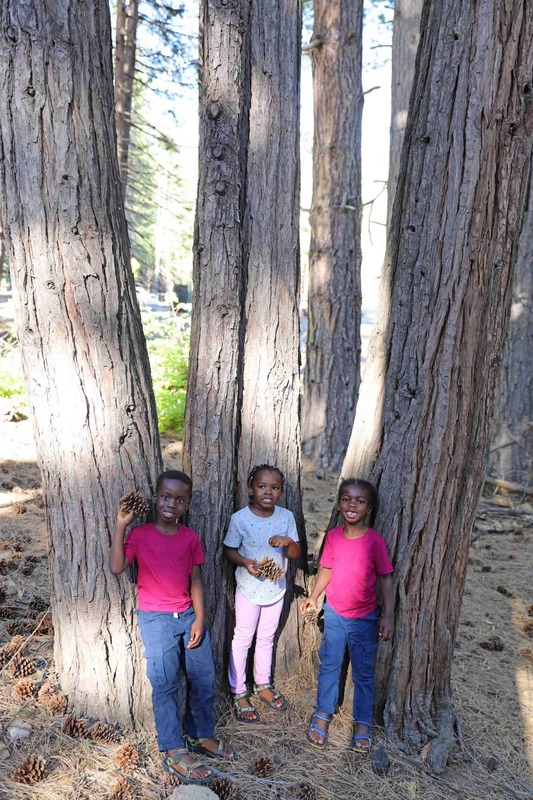 After much reading, I concluded that North Pines, Upper Pines and Lower Pines would be the ideal campground to camp with kids at Yosemite National Park. As soon as I figured out where I wanted us to camp, I realized that all the campgrounds were sold out. 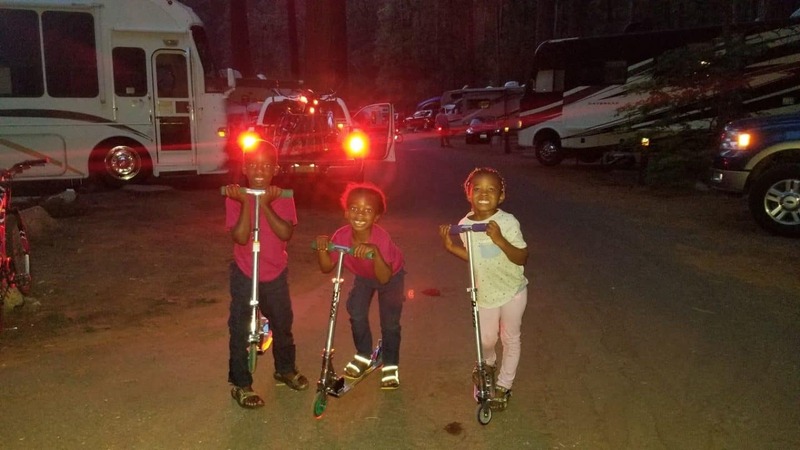 I read that was the case because campgrounds at Yosemite National Park need to be booked over 6 months to a year in advance. Our travel plans are usually spontaneous and last minute, so this seemed like an impossible task. 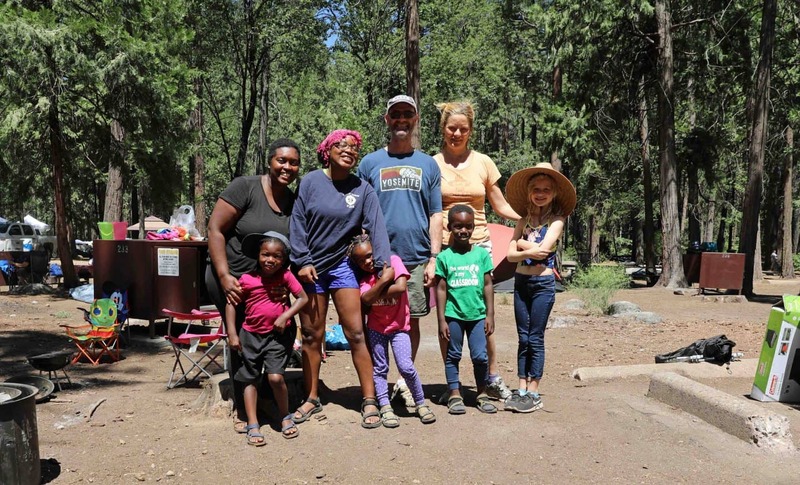 I had to take the kids camping and was determined to that this summer. 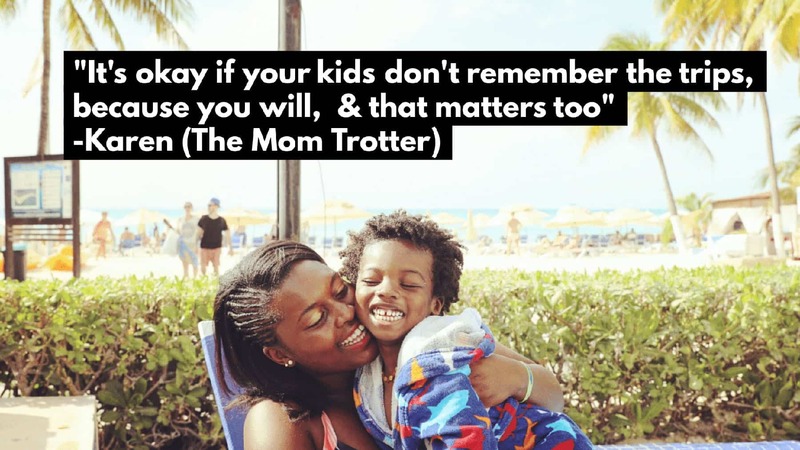 I was starting to feel discouraged until I came upon a website called YesYouCamp. 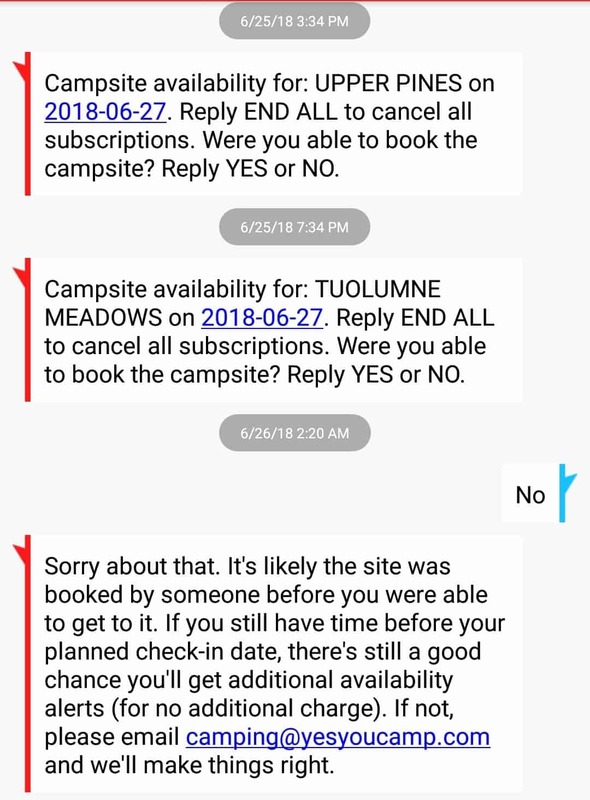 This website lets you enter the details of when you want to camp as well as your choice of campground, and sends out a text when someone cancels their reservation. I immediately signed up, selected Yosemite as well as Upper Pines, Lower Pines and North Pines and patiently waited for my text. The day before we left on our camping trip with kids, I got a text that a camp ground in Upper Pines had opened. 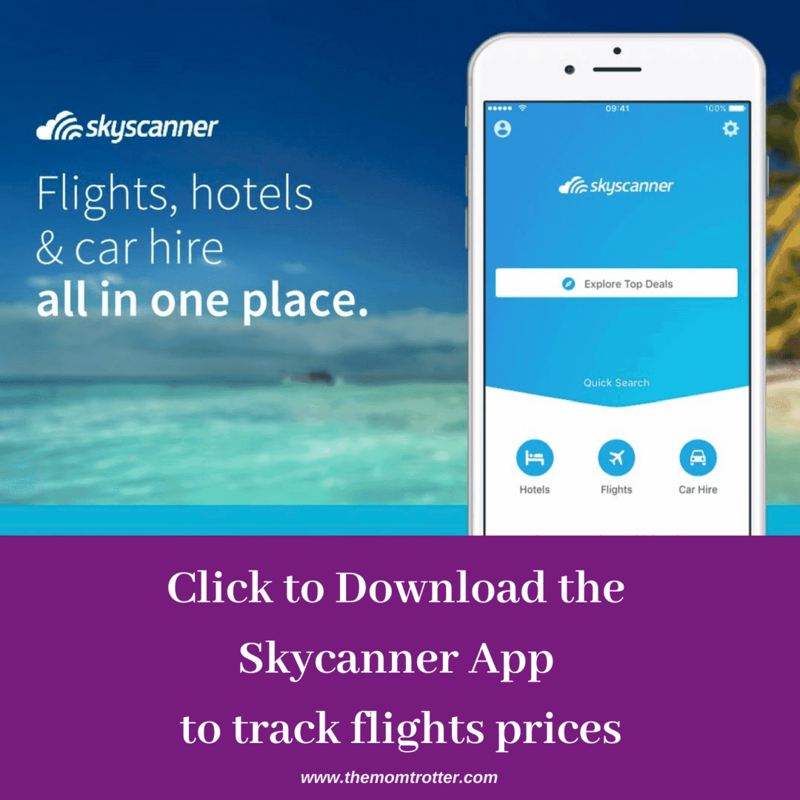 I immediately rushed to Reserve America which is the website where campground reservations are made, and was able to book a camp ground at Upper Pines. 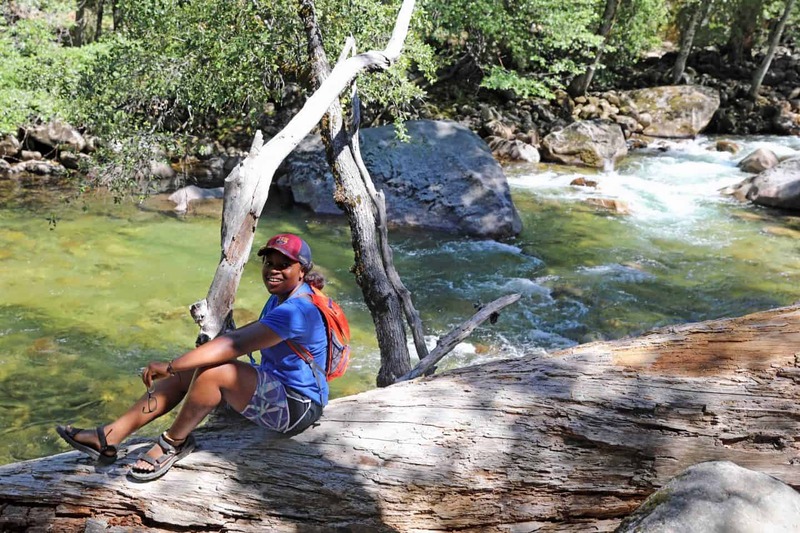 I was so excited about camping in Yosemite National Park, but also very nervous. 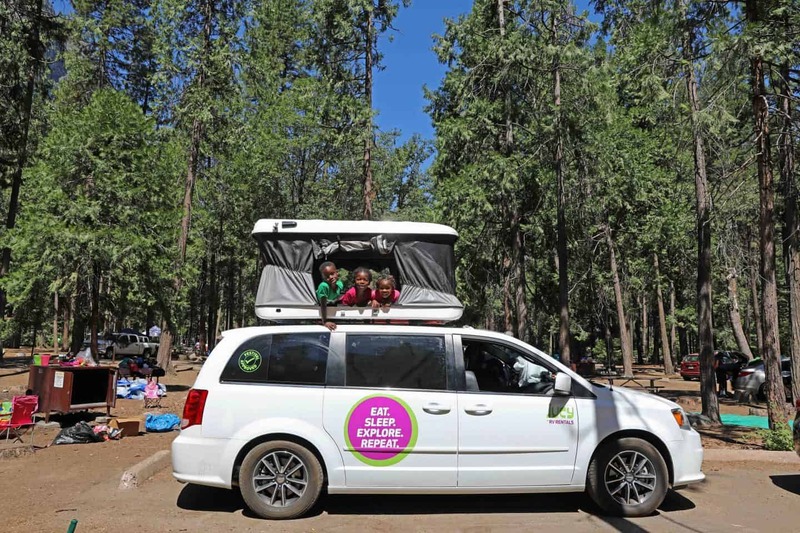 Pro Tip: YesYouCamp doesn’t charge you a fee until you book the campground of your choice. 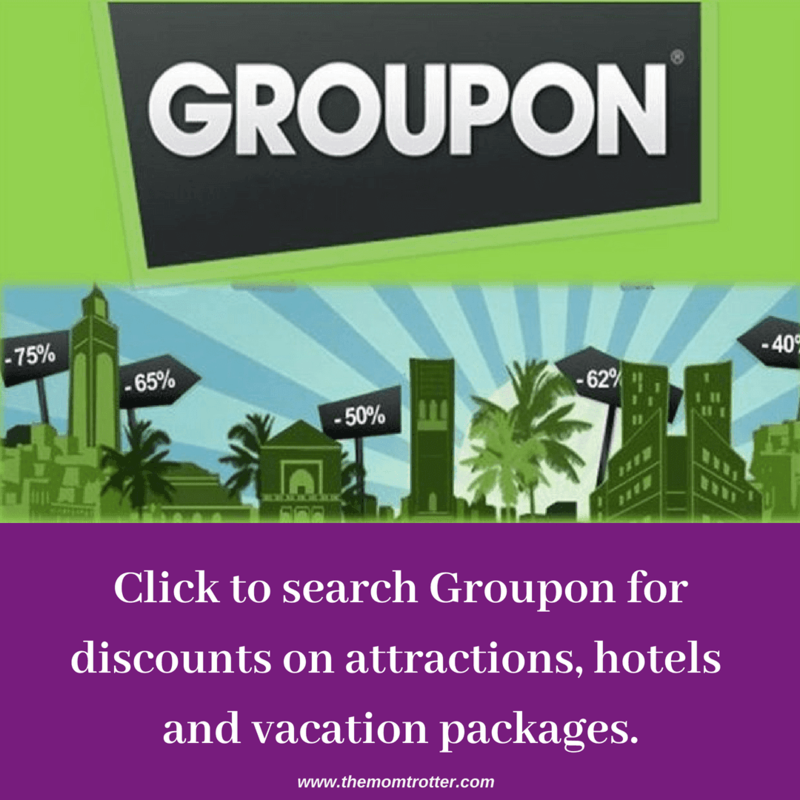 If you are not able to book any campground, they will gladly offer you a refund. 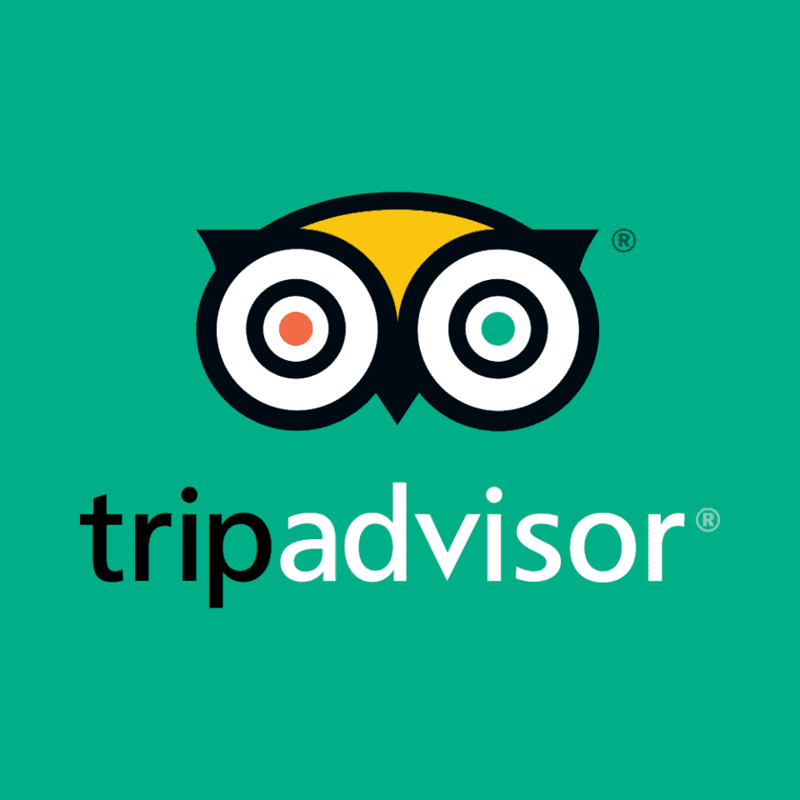 Their customer service is great and I would not only recommend them, but I would also use them again. When I booked the Upper Pines campground, we were assigned to campground number 233. 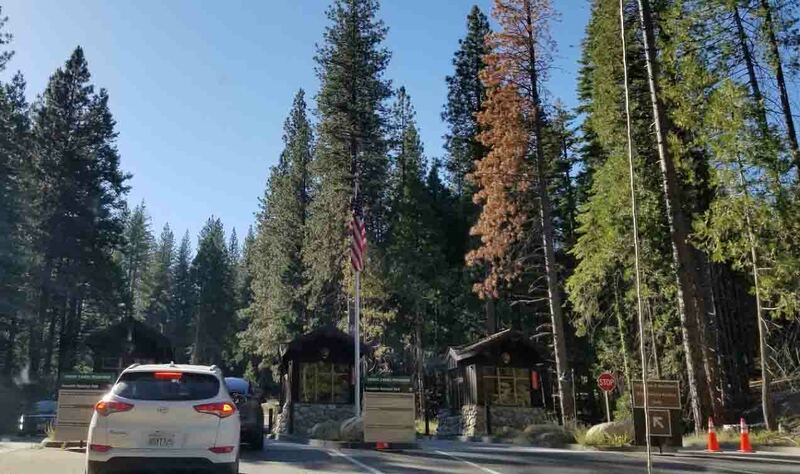 We got to Yosemite National Park about 5pm, and by the time we drove up to our campground, there was no one at the gate to check us in or guide us as to where to go. They do have a board at the entrance with every one’s name and campground site number, however I did not my see my name on the board. There was a phone number listed, so I called and was told to go ahead and go to my campground. We drove around a bit and then found campground 233. We parked our Jucy RV Van and took a walk around to get acquainted with the area while the kids rode their scooters. 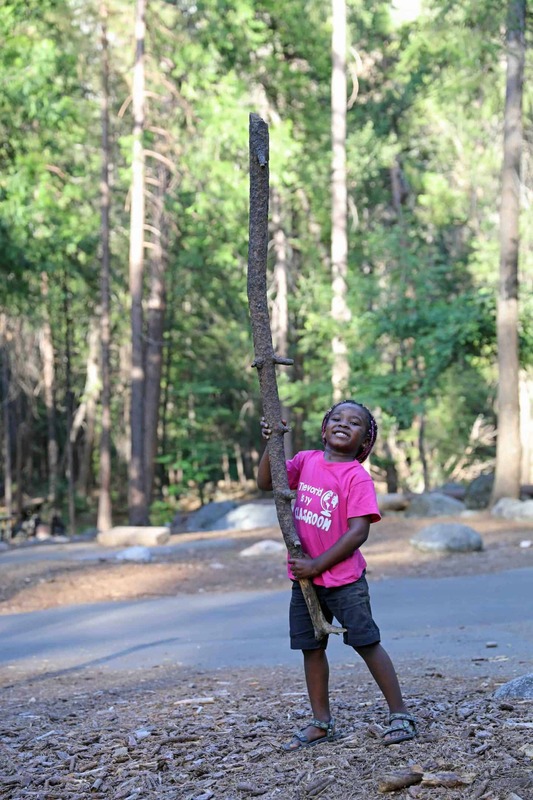 Yosemite National Park has such an amazing family friendly campground atmosphere. It is like a small village, where everyone looks after everyone. 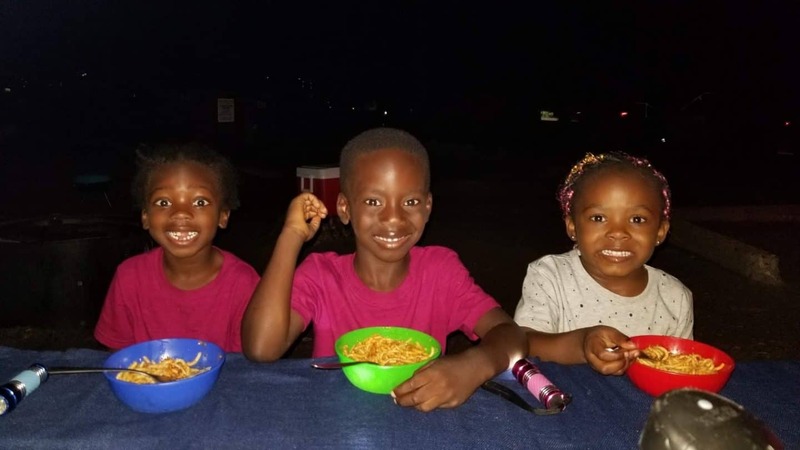 The night we go there our neighbors offered us to join them for dinner, everyone who passed by said hello, we ran out of ice and someone gladly offered us some, there were so may kids playing out who came up to play with my kids as well. Kid riding bikes, scooters, skateboards and enjoying the outdoor, families laughing and just having a good time. 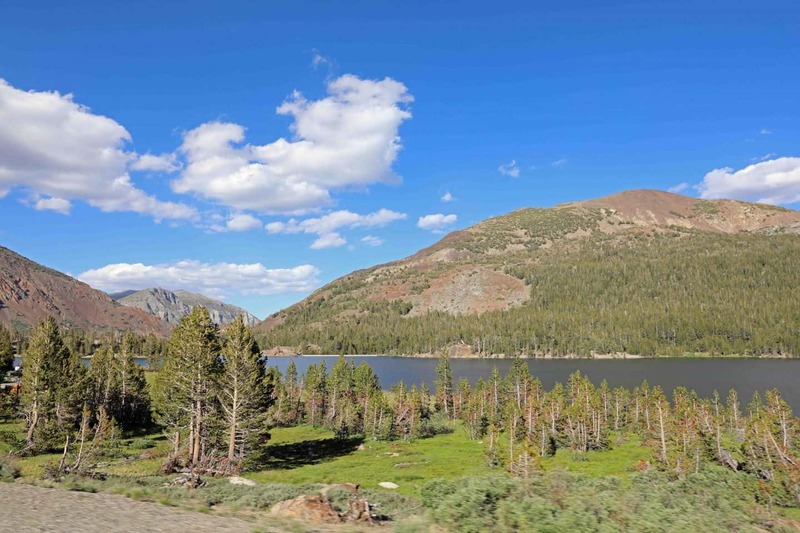 I did not know what to expect, but after being at Upper Pines campground in Yosemite National Park for just a few hours, I was already loving it and mentally planning my next trip back. 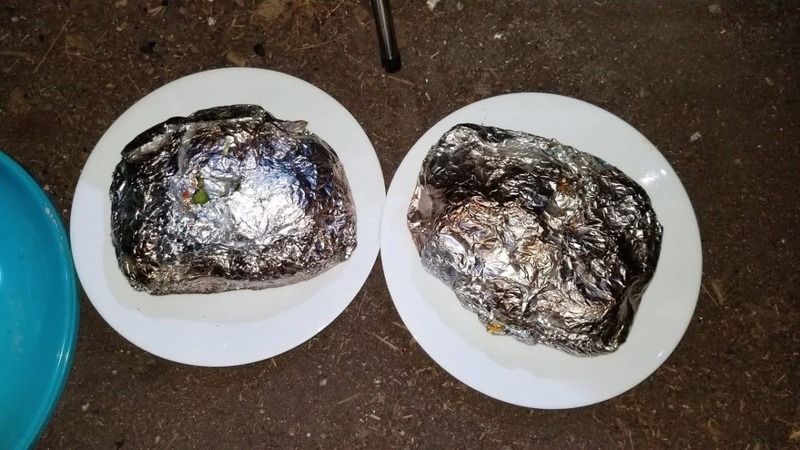 When I got to our camp site at Yosemite National Park, I was terrified of being eaten by a bear. I was glad to find out that bears do come around to look for food, however they do not eat people. Each camp site has a bear box for you to store all your food and toiletries, basically anything that a bear will smell and attract them. There are no showers at this campsite, so keep this in mind. I had a hard time dealing with this, however I did carry some water from the river and clean myself as well as the kids in the bathroom every morning and evening that we spent there. Each camp site has a fire ring, which is perfect for camp fires. However, we did not know how to light it. We weren’t prepared and didn’t pack any wood, so we sent the kids out to find some. Next time, I definitely plan to be prepared with enough wood to light up a fun campfire. 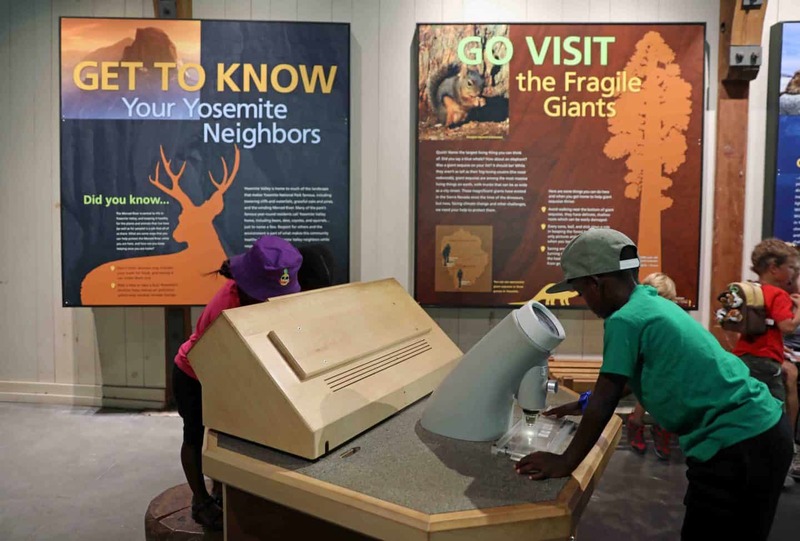 There are so many things to do in Yosemite with kids. I wish we had more time to do all of them. We definitely plan to return, and stay much longer this time. Once you start approaching the tunnel, then you know that you are much closer to the park. Make sure to slow down because once you get out of the tunnel, the most beautiful scenic view can be seen. There is a parking lot on the right side and we parked there and walked over to admire the view, and it was breathtaking. At Tunnel View, you can see El Capitan and Bridalveil Fall rising from Yosemite Valley, as well as Half Dome in the background. 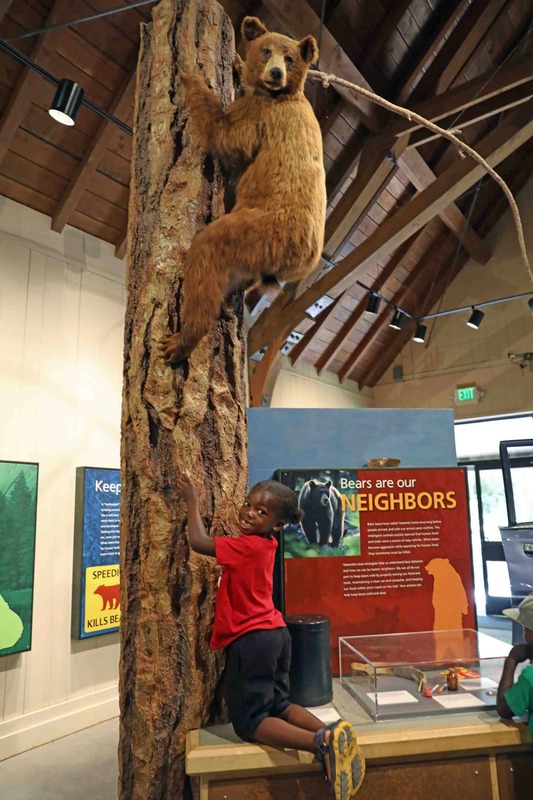 The Happy Isles Nature Center has an awesome museum, and the kids loved learning about the animals at the park here. The kids got their junior ranger books here and it cost $3 for each. This was the first time I’ve ever had a to pay for a junior ranger booklet especially as they are usually given free of charge at other parks. 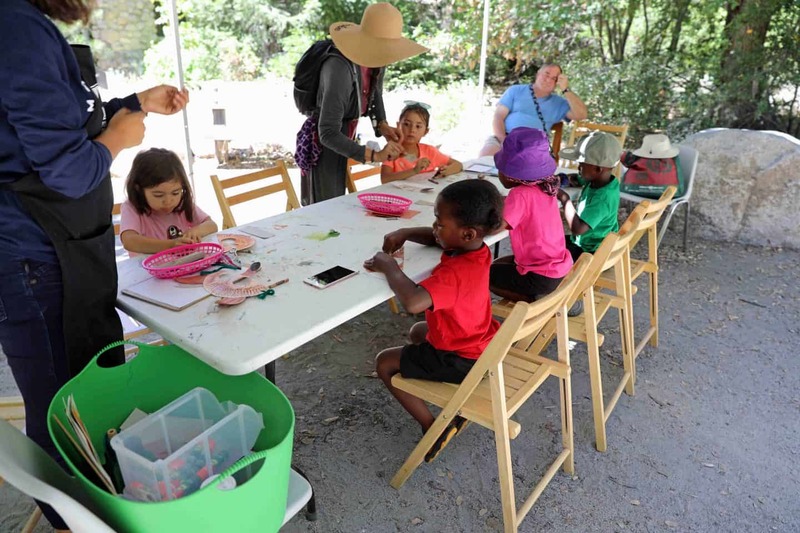 I signed the kids up for an art class at the Happy Isles Nature Center. I thought it was painting, however it turned out to be arts which was also fine. The kids made a fox mask and wore it the whole day until it ripped. This was the most exciting thing the kids did. 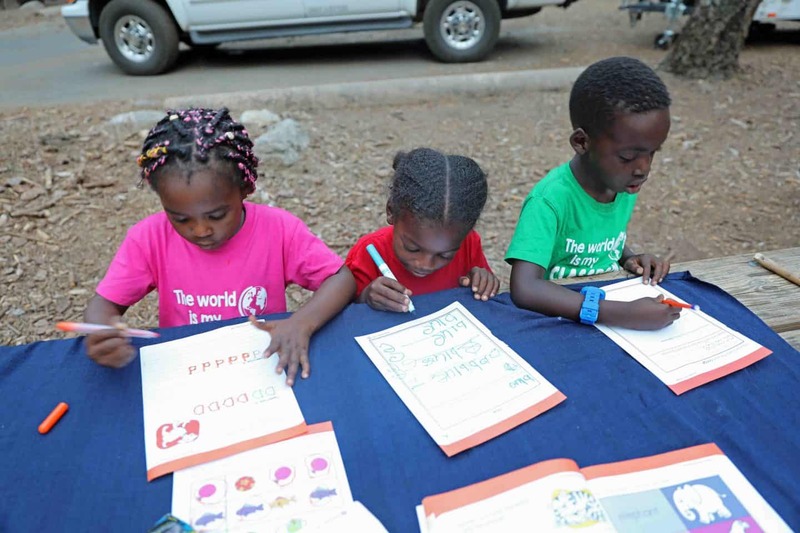 They were so eager to complete their books and they finished all the required activities. 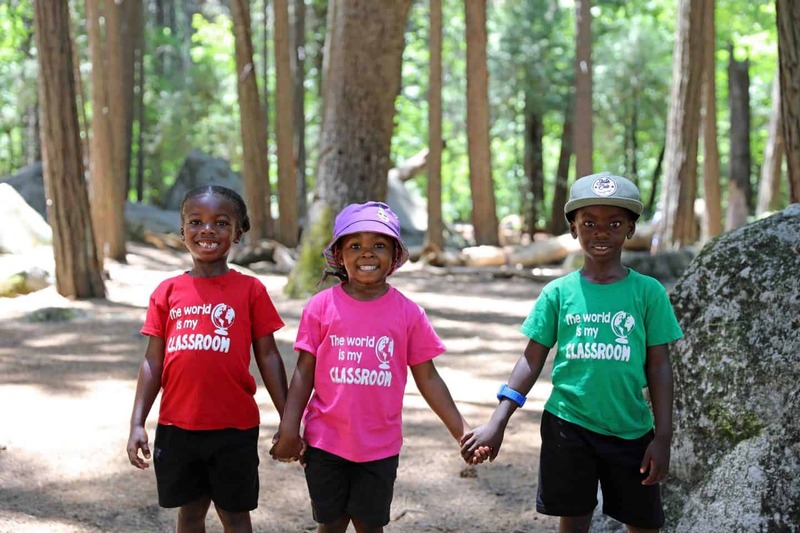 They were sworn in as junior rangers and they were so proud to wear their badges. 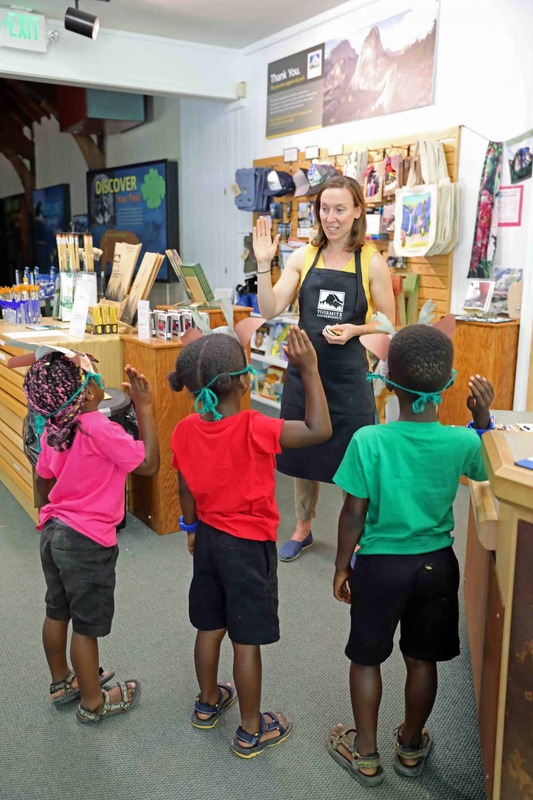 They were sworn in at the Happy Isles Nature Center. We followed the path to hike the Happy Isles trail. 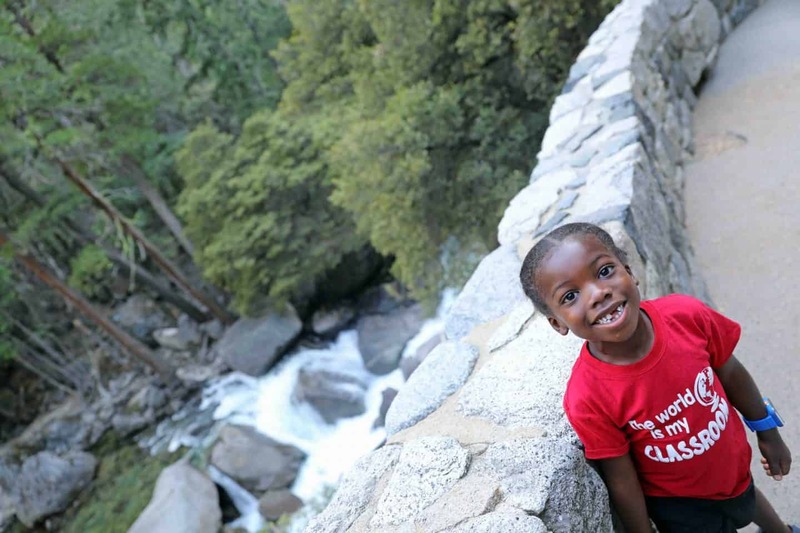 This is an easy hike with kids, which includes plenty of stops for exploration, photos and to spot animals. The kids and I spotted a coyote in the bushes as we were on our walk. When I originally, got on this trail, I figured it’d be an easy trail, and in just a few minutes I would arrive at the magical waterfall I was looking forward to seeing. Thirty minutes later and we were still going up hill, one hour late, still going up hill. The kids had the energy and were ready to keep going, I on the other hand was exhausted. This was a clear reminder that I was no match against these kids when it comes to strength and perseverance. After over an hour of climbing with several rest stops in between, I said that’s it, and we began making our way back down. 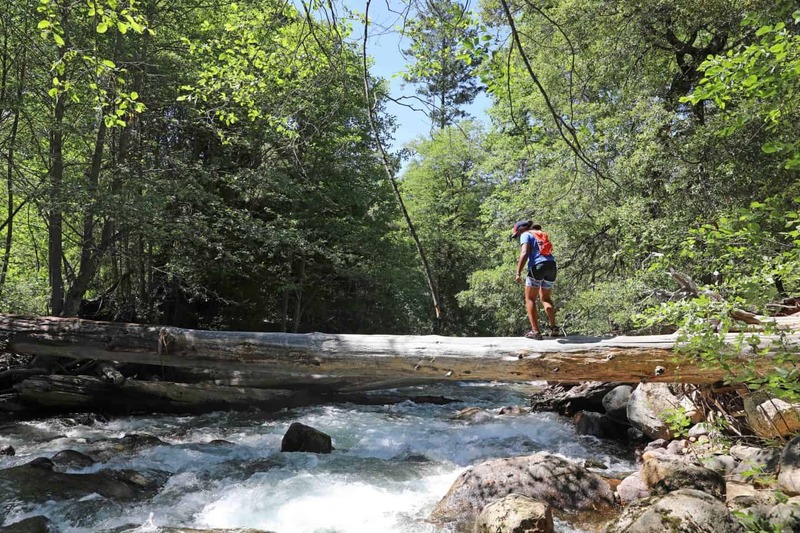 Pro Tip: Pack enough water before you venture this hike. We had a hiking water backpack filled with water as well as the kids thermos water bottles and I had my own water bottle, however we quickly ran out of water. 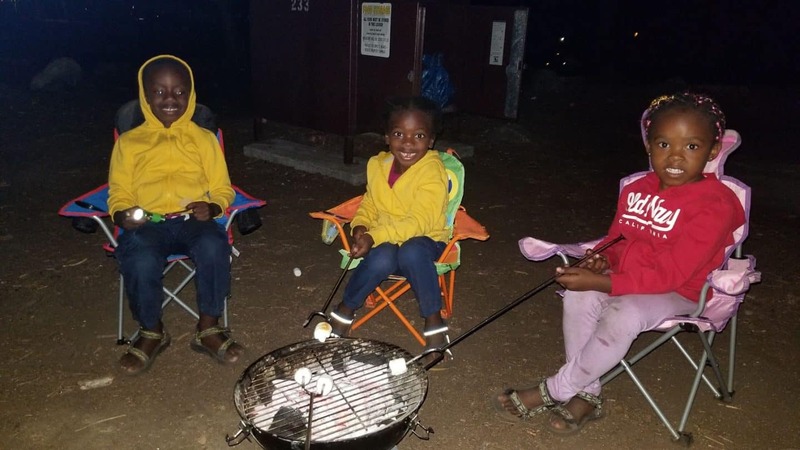 The kids made lots of new friends while camping. It was so nice to see them easily mingle with other kids and just play and have. 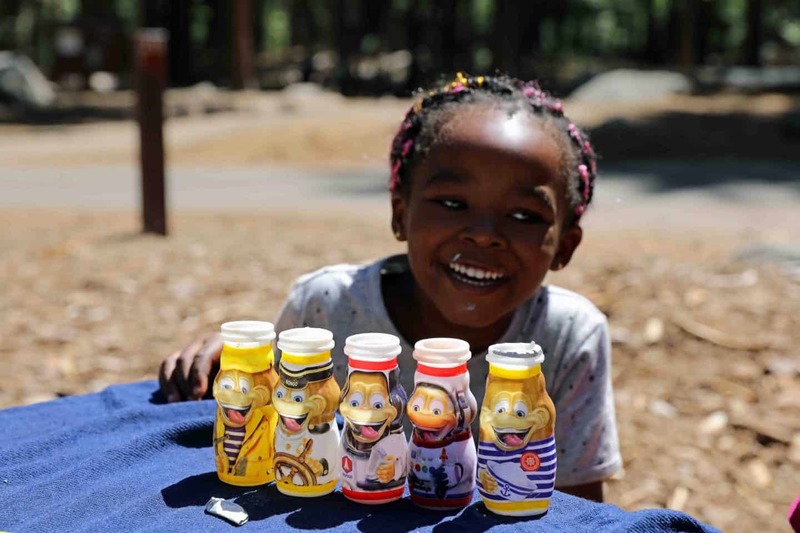 We also met another family who had a daughter that the kids just loved playing with so much so that we shared breakfast one morning with them. We were all sad to part ways with them, but got their contact so we could keep in touch. 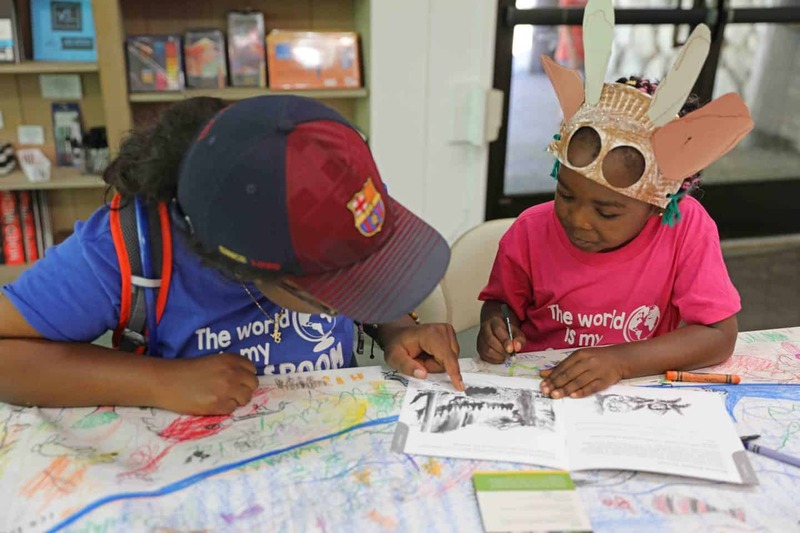 The kids are so into learning, especially reading and writing that they use every opportunity they have to learn something new. It is so amazing to see their love for learning which has been fostered through my guidance. I do not force them to do any learning, however I encourage it, so they normally on their own gravitate towards it without me having to ask. 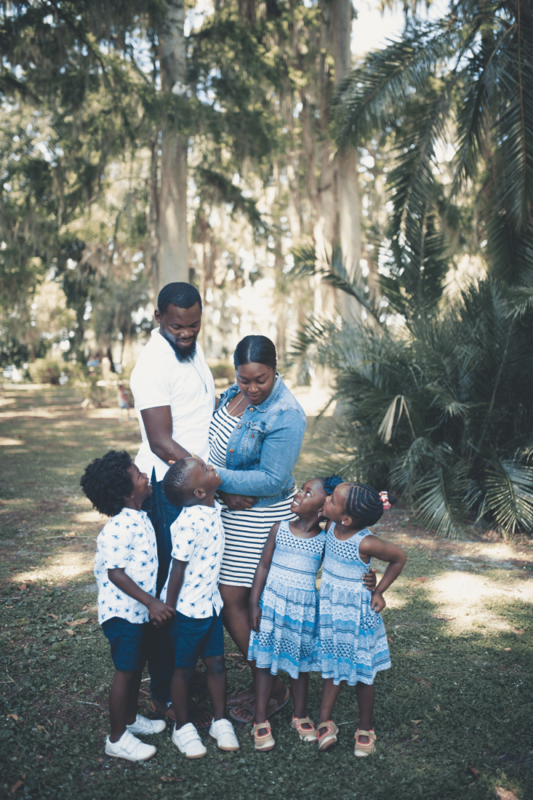 Make sure to read “Is Homeschooling Right For Your Family” and “How To Legally Homeschool Your Child” for how we do it. We checked out of our campsite at 11am, and started our drive out of Yosemite National Park. The scenery just blew me away so much so that I jumped out of the care barefoot and all to snap a photo. Yosemite National Park is one of the most scenic National Parks I have been to. These photos don’t do much justice, you have to visit this place to see and experience it also. 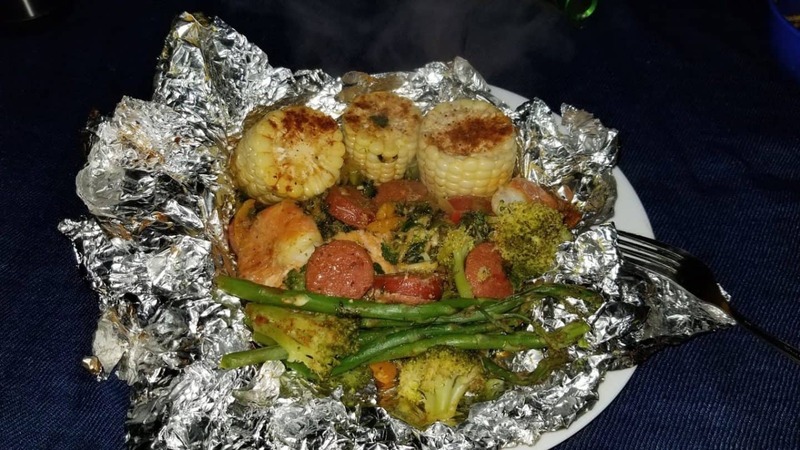 I prepped and cooked a variety of meals that I knew the kids would like prior to our trip. So when it was time, all I had to do was warm it up. 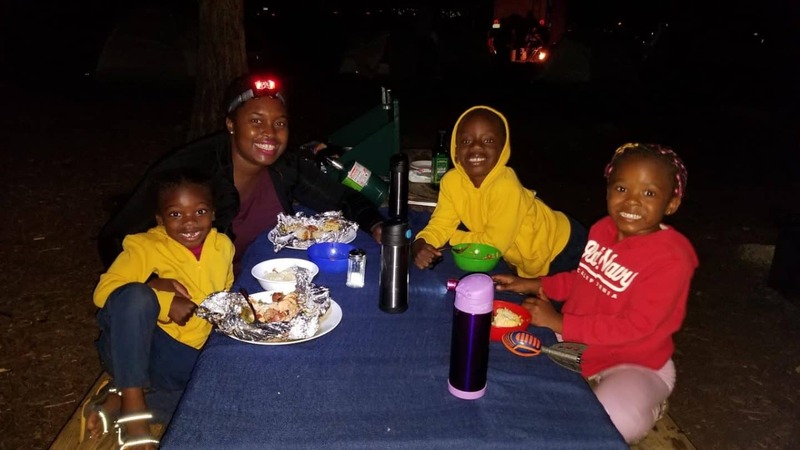 We ate so much good food while camping that I am so looking forward to doing it again. Breakfast: yogurt, bacon, pancakes, muffins, croissants, hot chocolate and coffee (we used powdered milk and powdered hot chocolate). We had such a variety of foods. 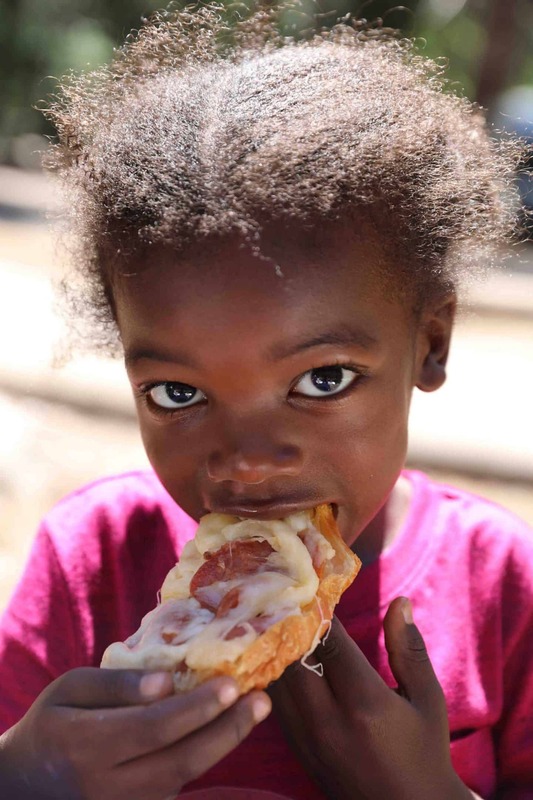 I even made croissant pizza with croissants, mozzarella cheese and pepperoni. Desert: Sm’ores of course ! 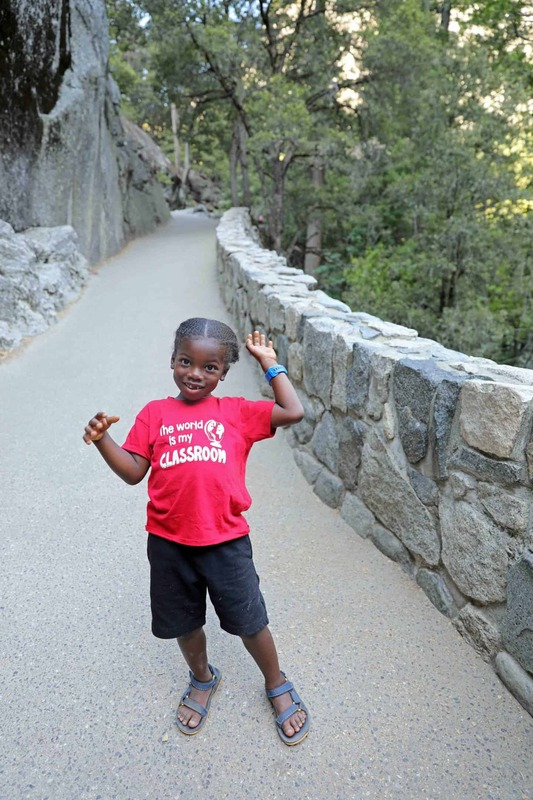 We spent a total of 2 days at Yosemite National Park, but from what you can see we could have spent a lot more days. We didn’t see or do nearly half of what we wanted to. 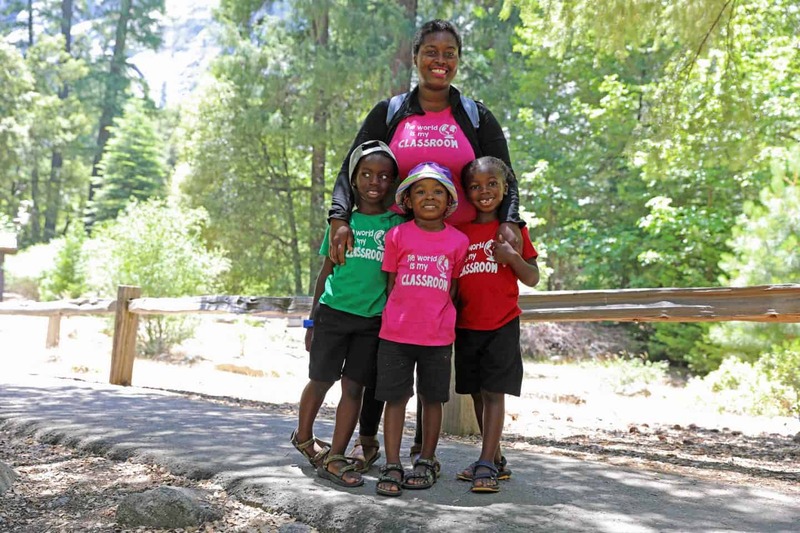 I highly recommend that families camp in Yosemite and our family plans to do it again soon. 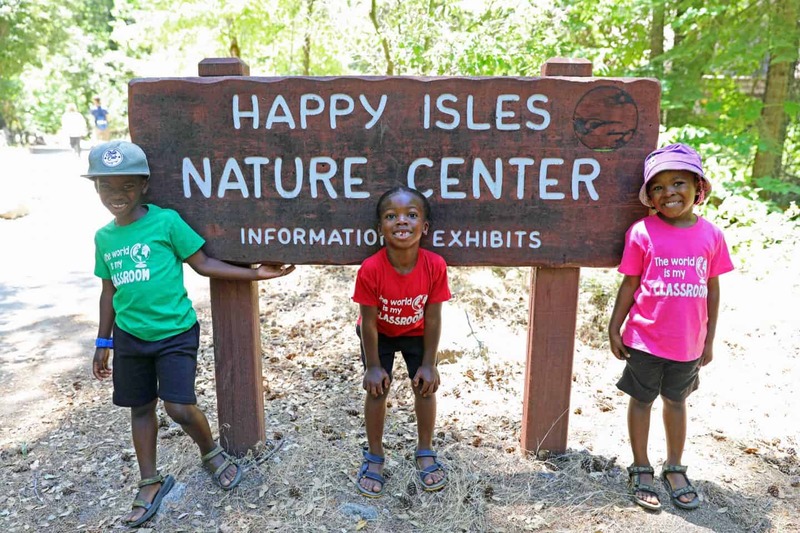 We hope to make it a yearly tradition, so that the kids can grow up with a love for nature.